For many years there was a common understanding emerging that lifts were the recognised way for garage operators to carry out vehicle maintenance and inspection. However, over the last ten years or so there has been a growing understanding that vehicle testing pits have a lot to offer. Generally initial set up costs are lower for lifts. However, it is very difficult to compare, amongst other things, it depends upon the length of the vehicle pit, the installation conditions, the accessories fitted etc. While on the other hand lift costs depend upon the type of lift and the quality, as some types of underground lifts are more expensive. Vehicle pits can be used in buildings with lower roofs. This is where vehicle pits win hands down. Once installed a pit can last forever. Lights and safety covers may need to be replaced from time to time but other than a re-spray the new steel prefabricated pits have very few other running costs. Lifts need constant maintenance and replaced parts. On top of this, they have a finite life. Lifts can also lead to cracked floors. The strength of the floor has to be considered. Also, unless large well bolted bases are incorporated into the posts constant use can lead to concrete floors deteriorating. Poor quality floors can lead to unstable lift posts. Once installed it is difficult to relocate an existing pit, while on the other hand lifts can be moved easily to a new location at relatively low costs. • Greater vehicle throughput – It is quicker and easier to set up and remove vehicles on a pit. • No down time for maintenance with a pit. • A pit makes it possible to work underneath a vehicle at the same time as above the vehicle. 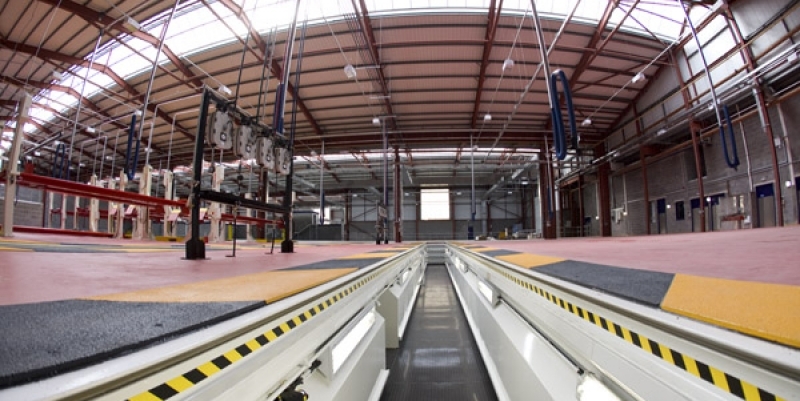 • With lifts it is easier to walk to other parts of the workshop for tools etc. However pits are now available with built in below ground workshops. • Pits can have built in brake testing units that are difficult to incorporate into lifts. • Pits are available that make it possible to wash underneath vehicles. • Two major problems with lifts are providing good quality directional lighting and when using air suspension there is a possibility of damaging the unit. Traditionally, pits had a poor reputation amongst mechanics. They were seen as dirty, crumbling holes in the ground built to the wrong depth. Additionally, water leakage was a problem often leading to mechanics working up to their ankles in water. Lighting and fume extraction was poor. Modern prefabricated pits have overcome all these problems and as a result pits have become much more pleasant places to work. Build up of fumes causing ill health and the chance of explosion. Very often pit safety is assessed on very old sites that were built 30/40 years ago when health and safety was not considered. Lifts have been known to collapse. Cables lying across the floor create a trip hazard. Other vehicles manoeuvring in the workshop can hit the lift. Equipment left lying on the floor. Poor floor conditions can result in unstable posts. The development of safety covers. These can vary from top of the range electrically retractable aluminium covers to manually operated budget covers. The incorporation of fume extraction equipment for petrol or gas vehicles. Safety lights that are safe with any fumes that may linger in the pit, again, for petrol or gas vehicles. Pits have therefore become very safe both for the people working in them and other people walking in the workshop. Also pits give a feeling of safety while with lifts there is always the sensation of having to depend upon some mechanical or electrical devise. This is particularly daunting when working under a large CV or bus. As can be seen there are benefits and drawbacks with both pits and lifts. Mainly since the advent of prefabricated pits many of the drawbacks presented by pits have been overcome. As a result the economics of testing and maintaining vehicles using pits, whether they are cars, vans, trucks, trains or buses are transformed both on day to day and lifetime assessment.